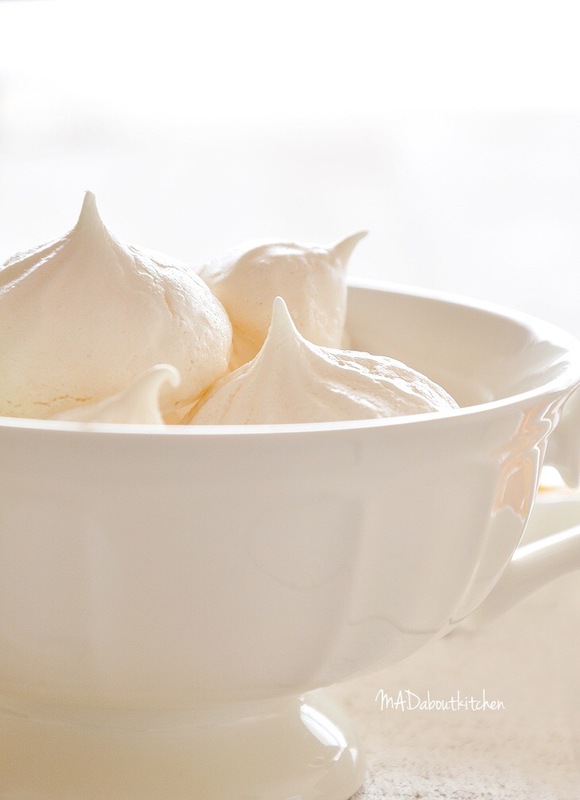 Meringues are something that i can make in my dreams. 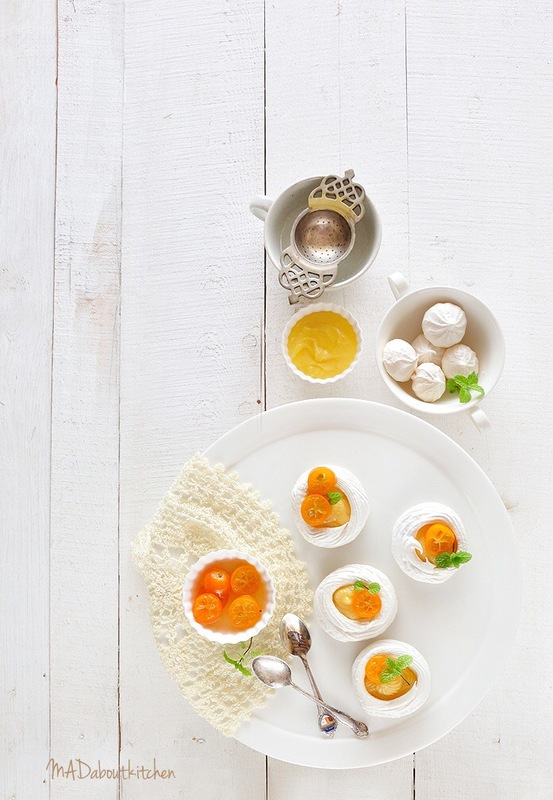 Meringues are always a hit when you serve it to your guests. 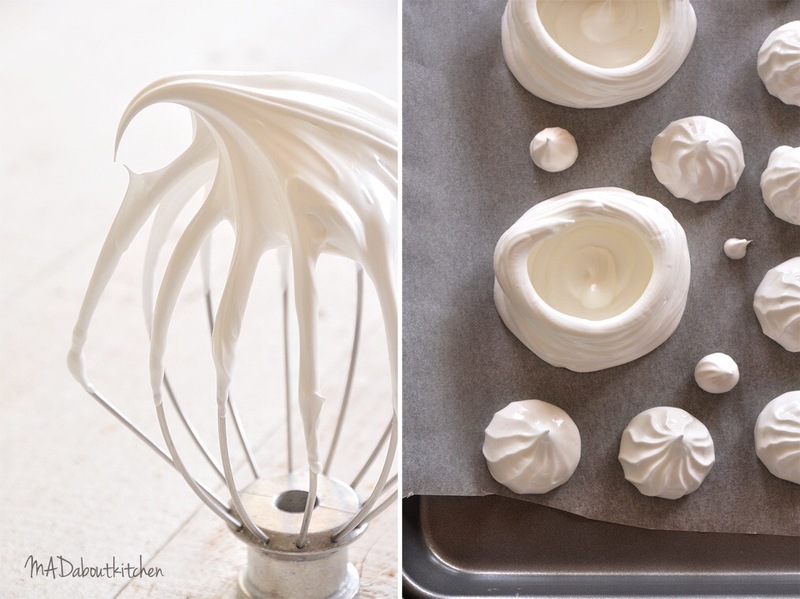 The airy, melt in the mouth meringues are so simple to make and can be made in different sizes and shapes. I usually have colourful meringues in different sizes stored up in a box at all the time. My son loves it and hence i always have it ready. Other than that I serve it as bite sized snacks along with tea. Fill them up in a bottle and wrap it up and it makes a delicate and a beautiful gift. Or use as garnish over brownies, cakes etc. Make it in advance and plate it up just before serving. All the components can be refrigerated for two weeks. Isn’t it just perfect for this Diwali and festive season?? 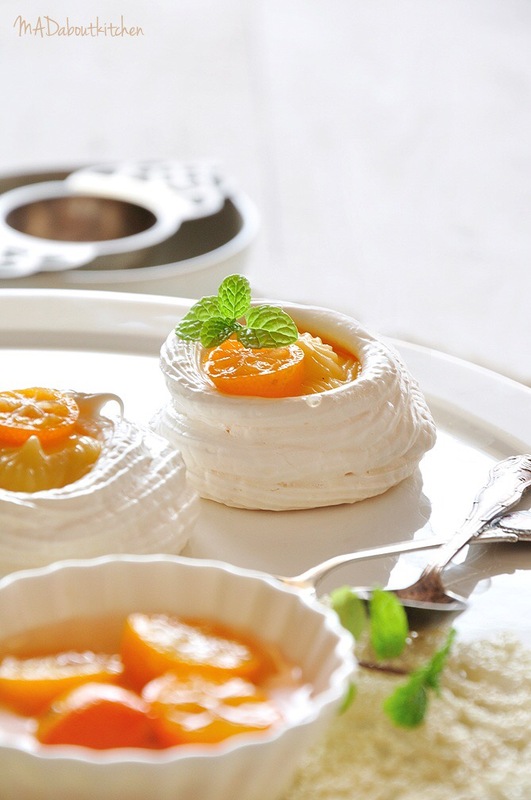 Follow the recipe of the meringues above. But with a little variation in the pipping. Bake it at 100°C for 1.5 hours. Once done, store immediately in an airtight box and keep it for later use. In a sauce pan boil water and sugar till the sugar dissolves. Add halved kumquats to this and let it boil for 15 minutes or till the kumquats look cooked and the sugar mixture is syrupy. Set aside to cool and then refrigerate. 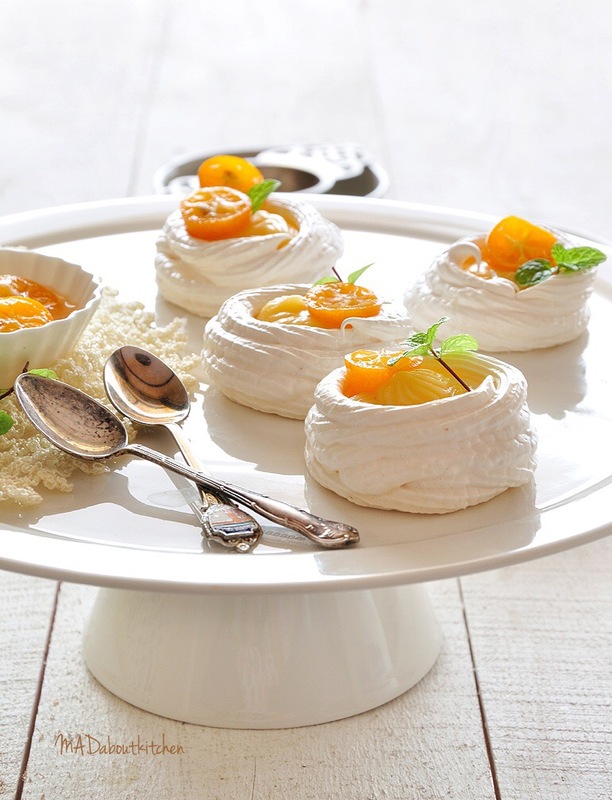 Just before you want to serve, place the meringues on the plate. Fill the curd to the top. Top it with sugar poached kumquats and drizzle the syrup on top and garnish it with some mint leaves. 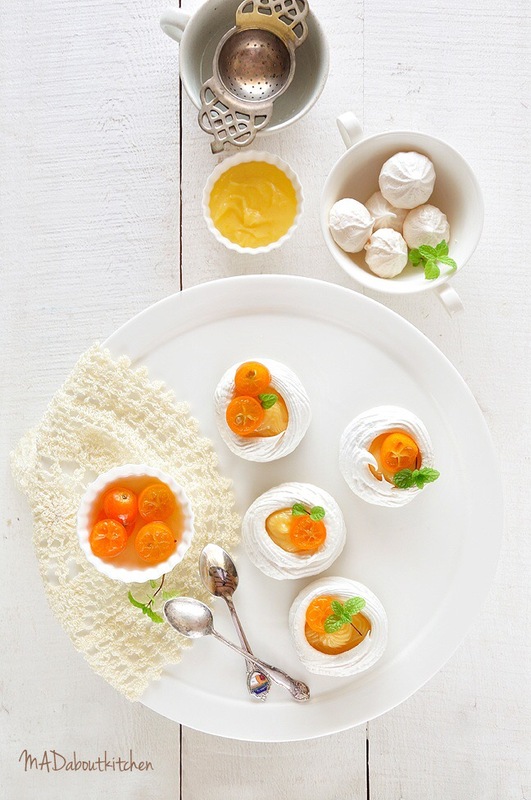 Serve immediately as the meringues get sticky very fast and will lose the crispiness. Hope you enjoy this dessert. Do let me know incase you try it. Thanks for collaborating with Purple Velvet Project on the Ultimate Guide to Dining & Entertaining Guide. 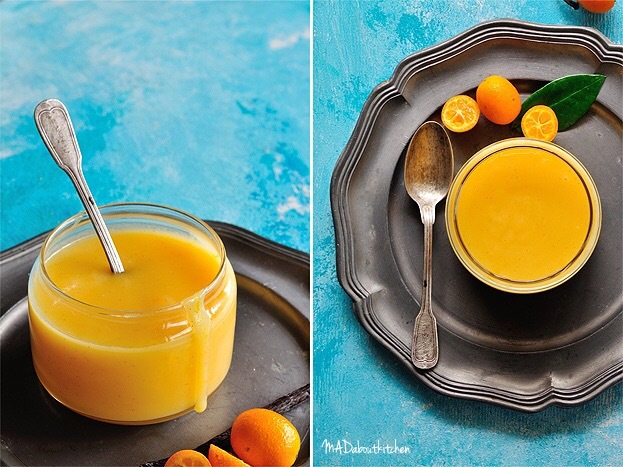 It was a pleasure featuring this dessert recipe.